Our very own Reagan Upton is spending the week in Lexington, KY getting a once in a life time opportunity riding for Team USA in the World Cup of Saddleseat riding. She is part of the Five-Gaited group. We wish her the best of luck. If you would like to follow along with all of the action you can use the link below. Saddleseat riding lessons are available at Stepping Stone Farm Riding Academy located in Chelsea, AL. The art of Saddleseat riding is a challenging, yet rewarding experience which any aged person can enjoy. 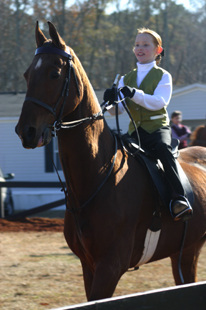 Saddleseat is the traditional style of English riding that is the basis for all other styles. Whether for fun or for show, Stepping Stone Farm Riding Academy can accommodate your needs in a safe, fun, family friendly environment. SSF is an accomplished riding academy which has been American Saddlebred Horse Association of Alabama (ASHAA) performance barn of the year and ASHAA academy barn of the year in the state of Alabama many times. Owner Courtney Huguley has many titles for instruction from all over the southeast. SSF sits on 130 beautiful acres with a 24 stall barn, large outdoor riding arena and a covered smaller arena. In addition to riding lessons, we also offer summer camp. Camp is an awesome opportunity to immerse yourself in the wonderful world of horses. Each student is assigned a horse when they arrive and are responsible for their care. It is a great learning experience, particularly if a child wants a horse. Be sure to check out our services page for more info on lessons, boarding, showing & camps. We look forward to seeing you at SSF Riding Academy. Make sure and check out our facebook page for photos from our latest events.